We create our superior performance putter with incredible, exotic woods from all over the world. Then we add stunning inlays and complete each putter with a quality finish. When choosing the wood, we focus on beauty and hardness. 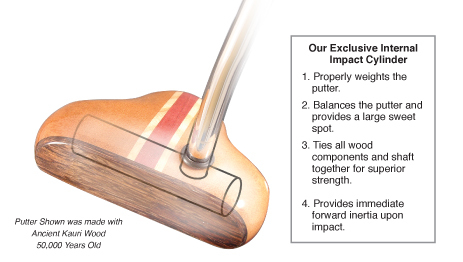 We create putters in hundreds of different contrasting colors, figures, and textures. Many of our putters feature stunning inlays with materials such as jewels, mother of pearl, fossils, or precious metals. We can customize a putter with virtually any special item. Finally we finish each putter with a high quality waterproof and UV protective resin. Our putters also are designed to improve your game. 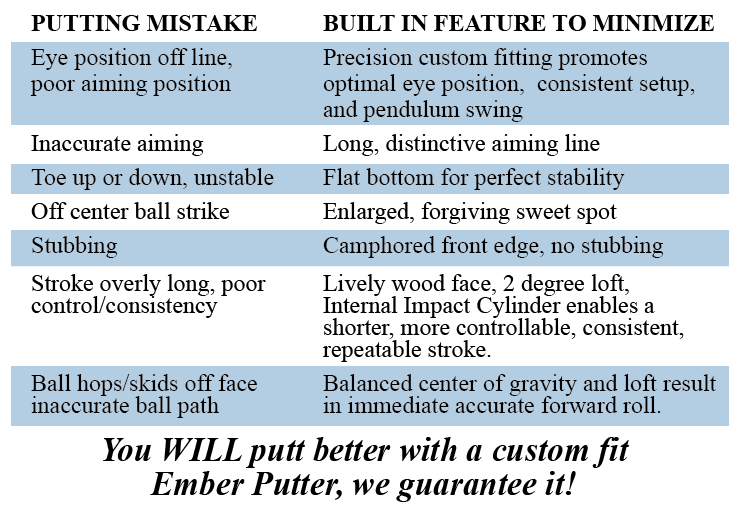 Built into every putter are features meant to eliminate or minimize putting mistakes. Our putters will help you develop consistency in your putting stroke. We create our superior performance putter with incredible, exotic woods from all over the world. Then we add stunning inlays and complete each putter will a quality finish. When choosing the wood, we focus on beauty and hardness. We create putters in hundreds of different contrasting colors, figures, and textures. Many of our putters feature stunning inlays with materials such as jewels, mother of pearl, fossils, or precious metals. We can customize a putter with virtually any special item. Finally we finish each putter with a high quality waterproof and UV protective resin.